DES MOINES, IA - The Iowa Barnstormers have punched their ticket to their first-ever United Bowl. The first-seeded Barnstormers earned their bid for the title with a 48-17 rout of over the Nebraska Danger tonight at Wells Fargo Arena in the IFL Semifinal. While the league did not utilize conferences during the season, this was billed as the United Conference Championship. With the win, the Barnstormers were crowned conference champions. The Barnstormers will host the 10th incarnation of the Indoor Football League's championship game on July 7. Kickoff is set for 5:05 p.m. pacific (7:05 p.m pacific). They will face the winner of tomorrow's Intense Conference Championship Game, which pits the Sioux Falls Storm against the Arizona Rattlers in Phoenix. The game is set for a 6:05 p.m. pacific (8:05 p.m. central) start. Iowa outscored Nebraska, 28-7 in the second half (21-0 in the fourth quarter) to run away with the win. The Danger kept the game relatively close through halftime and through three quarters, trailing by 10 at both points. The Danger scored on their opening drive on a one-yard pass from Gregory Hankerson, Jr. Iowa responded with an eight-yard touchdown pass to Ryan Balentine from Drew Powell. The first quarter ended deadlocked at 7-7. Brad Hatfield put the Danger up by three with his 24-yard field goal at the 9:29 mark of the second quarter. Powell scored on a pair of runs in the second quarter, of one and 11 yards and the Barnstormers' lead was 20-10 at intermission. Powell rushed for another one-yard run, but Angelo Pease pulled to within 10 once again when Hankerson found him on the right side from four yards out and ran into the right side of the end zone. Iowa held a 27-17 advantage at the end of three. It was all Barnstormers from there. Powell hit Balentine on a 30-yard bomb. Nearly eight minutes later, Jamal Tyler put Iowa up 41-17 when he took the pitch to the left side and scampered down the left sideline for the touchdown. Defensive back Rocky Hayes sealed the win when he intercepted Hankerson and returned it 34 yards for the touchdown. Hayes went on to intercept Nebraska's backup quarterback, Jesse Scroggins to snuff out the Danger on what turned out to be their final drive. Hayes was outstanding all night and finished with three interceptions to go with 2.5 total tackles on the night. 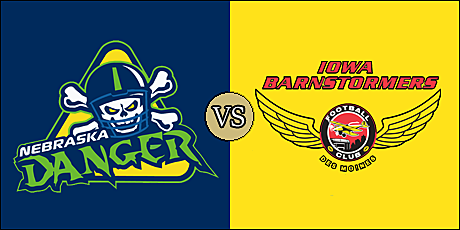 The Barnstormers outgained the Danger in total offense, 196 yards to 139, including a 104- to 60-yard advantage in the passing game. They held a slight edge on the ground, 92 yards to 79. Nebraska turned the ball over three times, on three interceptions, while Iowa lost a single fumble. The Danger were flagged nine times for 51 yards and the Barnstormers committed seven infractions for 54 yards. Powell finished 10 of 13 passing for 111 yards. He rushed 15 times for 48 yards with three trips to the end zone. Jamal Tyler finished with 7 carries for 39 yards and a score. Sheldon Augustine, who came off the injured reserve list earlier in the week, finished with six catches to 55 yards. Balentine added three receptions for 45 yards. Tyrell Pearson recorded 6.5 total tackles with a tackle for loss. Giovani Francois, playing his first game for the Barnstormers had a sack to go along with 3.5 total tackles. Hankerson went eight of 25 passing for 56 yards with a pair of touchdowns and a pair of interceptions. He rushed nine times for 68 yards. Kenzel Doe caught three balls for 48 yards. Pease and Armstrong each caught a touchdown pass. Nakevion Leslie finished with eight total tackles and a sack. Darrien Howard recovered a fumble and recorded a half a sack, while Davion Belk had half a sack. During the game, Barnstormers fans provided a birthday tribute to their former quarterback Kurt Warner. A native of Burlington, Iowa, Warner led the Barnstormers to two straight Arena Bowl appearances in 1996-97. He's probably the most notable Arena Football League alum. Warner led the National Football League's St. Louis Rams to a Super Bowl XXXIV championship, and was named Most Valuable Player in the game. Warner led the Rams appearances in Super Bowl XXXVI and the Arizona Cardinals in Super Bowl XLIII. He turned 47 years old on June 22, and it was noted that the Barnstormers would forward recordings of the birthday wishes to him. The Danger finish their season overall at 4-11.